We’ve all been led to believe that, in order to ensure our survival, our brains were wired to focus on negativity. The intensity of our memories regarding what makes us feel badly far outweighs the intensity of memories of the positive events that make us happy or give us relief. Many of us obsess over the news and about fears that have been passed down from generation to generation. We all know of people who had contributed in many positive ways to society, but as soon as they did one thing that we judged as unacceptable, all the good they had done seemed to be forgotten. All of this focus on negativity stems from back in the day, when there were real dangers lurking in the shadows – it was better to be safe than sorry, and to react in fear to ensure that we escaped harm or death. It was important for us to remember the pitfalls so we could stay alive and keep our families safe. These days, we really don’t face life-threatening situations very often, but the fears and negative focus still seem to consume many of our thoughts. Negativity becomes habitual, and the worse we feel, the more negative people, situations, and things we attract into our lives. A more positive mindset takes real focus. The best way to change your life is to change your mind, and then your feelings will change as well. The better you feel, the more at ease you are, and more a match to a happier life. If you know any people who are primarily negative, you have probably also witnessed a lot of struggling going on in their lives. To the contrary, those who have created a more positive mindset, who typically see the glass as half-full, often experience more joy and success. I wrote Happy Habits specifically to help people become more aware of their thoughts, so they can experience more joy and success. 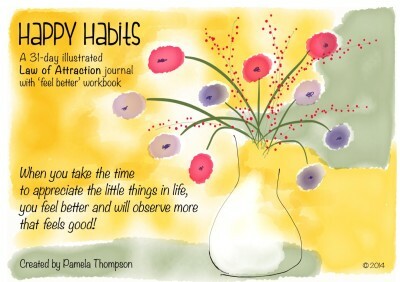 Happy Habits teaches several easy-to-use tools, and a 31-day illustrated journal to enable you to focus and retrain your brain to be more positive regardless of outside events and other people. Click here to be directed to Amazon, where you can search inside my book. 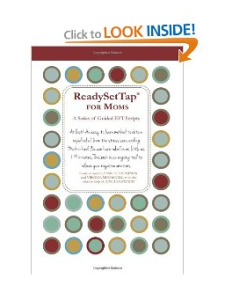 I hope you find the tools insightful and empowering.